Every department in your organization needs a dashboard. However, you might require expertise to optimize it to suit all your employees' needs. Ask yourself these questions - What information do you want to see in your web analytics dashboard? How will you sort and collate the data? Who will access it and the most important of all, why do you need the dashboard? Outsource2india is a pioneer web analytics dashboard development company, which provides you with all the services related to web analytics dashboard development. You can collaborate with us to drive your enterprise's innovation through a high performing web analytics and dashboard reporting tool at your facility. At O2I, we have a dedicated team who focuses on the gathering of the requirements and developing the end-product using your data sources. Our web analytics dashboard developers are expert in developing core data sets that can be leveraged in the customized dashboard. Moreover, we can fine-tune your current web analytics dashboard and properly integrate it with the right metrics. Tableau can handle the challenges of scalability that is why it is preferred over other web analytics dashboards. At O2I, when you outsource dashboard development services to us, we can help visualize your data in the most intuitive format. Our tableau dashboard development services and data implementation will assist you in making real-time informed decisions. O2I is a pioneer in providing Klipfolio dashboard development services. When you rely on us to develop the Klipfolio dashboard, we can make it work as you intend – easy to use and practical. We can also tweak the dashboard and insert HTML to customize its functionality and give a new outlook. At O2I, we have adopted a holistic approach towards providing our web analytics dashboard development services. We maintain our standards all the time and when you partner up with us, we will also provide support and maintenance services. If you need any modifications in the dashboard or need guidance on its workability, we can efficiently do that. Why Choose O2I for Analytics Dashboard Development Services? We provide our clients with flexible pricing options for web analytics dashboard creation services. We allow the clients to choose the design, tools leveraged, the resources used, and complexity of the dashboard before we begin the development process and pay for only that. At O2I, our team of web analytics dashboard development professionals has access to the state-of-the-art infrastructure in the form of world-class office, uninterrupted network equipment, modern web analytics dashboard software, and modern communication tools. We can proficiently render our services for all your web analytics dashboard development needs with our relevant industry experience on the web dashboard development. Outsource2india has a global footprint with five different delivery centers and four global offices. This allows us to effectively cater to your requirements from multiple corners of the world and in the language, you prefer. We are an ISO/IEC 27001:2013 Information Security Management System (ISMS) certified organization. This ensures that all your data is completely safe with us. We have several data security policies in place which ensure that all our employees sign confidentiality agreements and use biometric systems to enter and exit the office premises. This ensures that your data is accessed by only authorized personnel. When you decide on outsourcing web analytics dashboard development services to O2I, you will be our partner of choice. It means you have the flexibility in terms of choosing the price and process. The number of resources, the scope of work, and the length of services - all depends on you. Outsource2india is one such provider of web analytics dashboard development services in India who has worked with a gamut of industry verticals including retail, e-commerce, Information Technology, hospitality, electronics, telecommunications, etc. 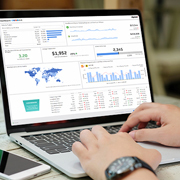 When you entrust the web analytics dashboard development to us, we will ensure the delivery of a high-performing dashboard that boosts your business outcome. Our executives work day in and day out across all the time zones to cater to your requirements and inquiries. They are accessible 24*7 and when you partner up with us, you can be certain that our contact center executive will always be accessible for your calls regardless of the time zone difference. At O2I, we have the necessary resource capability, both in terms of expertise and wherewithal to ramp up our services when required. You can depend on us for any spike in your business demands and exploit the cost advantages, gain a time-value advantage, and boost ROI. Read the case study to learn how O2I helped a US logistics company with web portal development as well as a payment option. We designed the portal to support maximum interaction without lag in performance. Read a case study on how O2I provided Custom Theme for an Australian Training Course Provider with features that recognizes users. O2I developed a customized theme package for the client so that they can toggle between themes. I can't say enough about the excellent work that Outsource2india has done on our website. They took a below-average website and transformed it into an appealing and informative website. It was an absolute pleasure to work with them. The designer listened to my thoughts and suggestions and far surpassed my expectations. Outsource2india has been a pioneer in providing Web analytics dashboard development services. We provide a robust service for your web analytics dashboard and a series of other custom software development services to its global clientele. At O2I, we have an extended suite of web analytics dashboard developers who can provide you with a high-level of scalability & flexibility, which can be customized based on your service needs. We have in-depth knowledge and understanding of the technology related to web dashboard development. We have rendered our services to the exact requirements of several global companies. We continuously grow and streamline our web analytics dashboard development process to deliver immeasurable value to our clients. Get in touch with us today for reliable, efficient, and cost-effective web analytics dashboard development services.